My Dad always loves to poke fun at the science fiction genre, particularly the dystopian movies. He loves that no matter what, the view of the future is always dark, and he's pretty much right. Besides "Futurama," "The Jetsons," and "Star Trek," how many other views of the future turn out happy? When was there another instance of a future where we didn't blow ourselves up? Where aliens didn't colonize us? Where something or another didn't reduce us down to an abysmal percent of population? Are those three examples the only examples in the history of popular culture? Could be, I won't pretend like I have seen everything. I think "Children of Men," is different on an entirely different level than the rest of the dystopian future flicks. 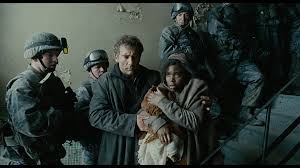 "Children of Men" maybe similar at first glance, but what hits me in the heart every time I watch the movie is its overwhelming optimism in the face of bleak darkness. This film presence a future premise that is as jet-black as all the rest. The idea of not being able to create life anymore is horrifically sad. The film paints a portrait of life that involves terrorism, economical turmoil and chemical warfare, all things we worry about today. Add to the fact that a man and a woman can no longer make babies, and you have a world nobody wants to live in. The film's opening sends shivers up and down my body every time. As a news castor tells a story of how the youngest person alive has died and new youngest has been found. It is a wonderful setup, no matter how bleak it all is. Another thing I love about "Children of Men," is just how realistic the movie feels. At no point does this film feel like your typical, futuristic movie. Sure, there is some cool technology that clearly does not exist yet, but it constantly feels plausible. Sometimes it hurts my eyes when futuristic movies include spectacle for the sake of it, just so the audience knows that this movie takes place in the future. I love that everything about this movie feels like it spawned from something real. I love how grounded the look and tone of the entire movie. It is so hard for Hollywood to create realistic futures, but this film makes it all look tremendously easy. Then there is the cast, the film is headlined by Clive Owen, who plays a man who is picked to protect a mother carrying the first child born in years. It turns into an unbelievable task, but an important task. Especially since its his ex-wife, played by Julianne Moore, who recruits him. Both Owen and Moore doe extraordinary work in this movie, and this particularly represents some of the best work by Owen ever. I also love the supporting cast, which includes Michael Caine, Chiwetel Ejiofor, and Charlie Hunnam. They really bring this story to life. What makes "Children of Men" worth watching this week is how subtle, yet profoundly the movie embraces the idea of the nativity story. This is not a movie that shoves religion down your throat. But if you analyze it, this is a movie about defining hope and that message crushes me every time. In the best possible way, of course.